This is Volume 10 of Renate Eggebrecht’s pioneering survey of 20th century solo violin repertoire. Here she focuses on three Finnish composers. Once again, the collection is wide-ranging, and I'm sure the music featured will be a first time encounter for most. I, certainly, have never come across any of these works before. In fact, two of them, the sonatas by Kalevi Aho and Pehr Henrik Nordgren, are here receiving their world premiere recordings. We open with Rautavaara's Variétude of 1974. This short 5½ minute work won a prize for the composer in a competition. Dissonant and spiky, Eggebrecht has full measure of the ebb and flow of the undulating landscape, which she traverses with admirable technical prowess. Nordren's Solo Sonata glances back into the past with thoughts of eternity. The dirge-like narrative has a static quality to it. Eggebrecht captures some wonderful diaphanous sonorities, which she contrasts with more strident timbres. The overall effect is a kaleidoscope of sonic richness. 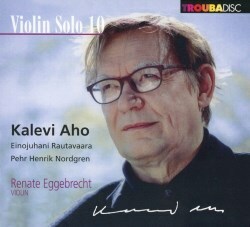 The main bulk of the disc is assigned to works by Kalevi Aho, whose photo proudly adorns the cover, and whose name is prominently featured in bold. Solo 1 (Tumultos) was written in 1974, the year following Rautavaara's Variétude. There are two distinct parts, the first forming a tranquil introduction to a more vigorous section. The music becomes 'tempestuous' and 'tumultuous' and the sustained aggressive onslaught I found slightly wearisome and tedious after a while. Of all the works featured, this one I like the least. The four-movement Sonata, which predates Solo 1 by two years, is the highlight. The title of the opening movement, Tempo di ciacona, gives one a clue as to its direction. Yes, Johann Sebastian Bach, and the Chaconne from his Partita No. 2 is strongly alluded to. Yet, this is no stylistic imitation. For Aho, Bach is the start of his own personal journey. The Andante second movement again pays lip service to his predecessor. The music brings an element of calm, and the con sordino effect is like balm to the ears. A fugal discourse follows, leading the listener to a determined and purposeful finale. In Memoriam Pehr Henrik Nordgren is, as the title suggests, Aho's tribute to the death of his colleague in 2008. The music, in the words of the composer, dwells on 'thoughts of eternity'. The acoustic of the Clara-Wieck-Auditorium is fairly resonant and I would have preferred something a little warmer and more intimate. Nevertheless, I’m pleased to have encountered the riches that lie within these captivating scores.